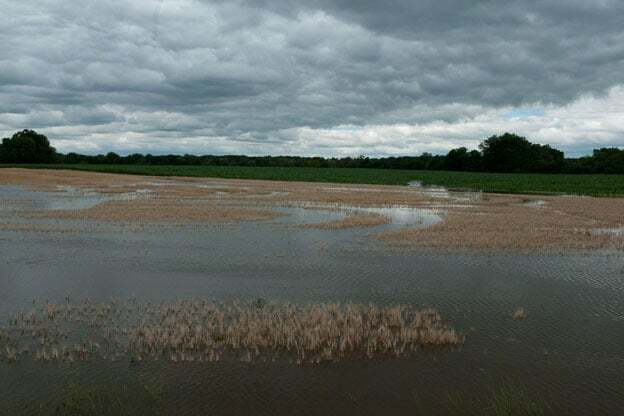 To save crops that were threatened by Mississippi River floodwaters farmers harvested wheat two weeks early from the Yazoo River area near Yazoo City, Ms. on May 16. 2011. The lines are from combines and the wide tires. COLUMBUS – The wet weather this month isn’t just putting a damper on cookouts, festivals and pool parties. It’s also starting to hurt Ohio’s growing season. Heavy rain over the past two weeks has soaked farm fields around the state, including Anderson Orchard in Pickerington. Its owner, Steve Anderson, said the season started out great, but with the continuous rain he’s now worried about lost crops and profit. According to the National Weather Service, areas of Ohio have seen anywhere from 25 percent to more than 100 percent more rainfall than average this month. Several studies, including the National Climate Assessment, link heavy downpours, flooding and other extreme weather events to climate change. Samantha Allen, energy program coordinator for the Sierra Club in Ohio, said the amount of greenhouse gases entering the atmosphere is dramatically changing the climate, with an estimated 30 percent increase in heavy rainfall in Ohio since the early 1980s. She said it’s a critical problem to address because agriculture is the state’s number one economy. When it comes to heavy rains and flooding, Anderson said there’s not much he can do to protect his crops. He said he believes combating climate change is going to take a national and international effort. The Environmental Protection Agency’s Clean Power Plan, which is expected to be finalized this summer, proposes a 29 percent reduction in carbon dioxide air emissions in Ohio from 2012 levels. The National Climate Assessment is online at nca2014.globalchange.gov.